Heidi Gill is a writer of bilingual children books. Mother of two vivacious kids and lover of books, Heidi frequented book stores and online book sellers looking for Punjabi/English books to help educate her children on their father’s culture and language. Finding little other than Spanish/English books, Heidi decided to fill the void by producing her own children books. Inspired by her kids’ curiosity, she was determined to provide a basic introduction to her children of the most common languages spoken in the world: Chinese, Hindi, Spanish, Arabic, and French. 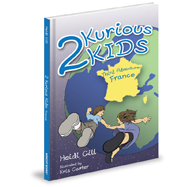 To begin her educational children’s books, Heidi developed the brand 2KuriousKids. The series initially targets children aged 3-10 with a desire to learn and explore. From here, she intends to incorporate other languages and expand to other age groups. Heidi is passionate about education and teaching her children that while some things like food, sports, and language are different in other countries, people are the same everywhere. Raising her children with a deep understanding of the beauty and value of multi-cultural diversity, Heidi’s journey has led her to publish her own educational materials.